Probably everyone remembers where they were and what they were doing on Tuesday, September 11, 2001, now familiarly known simply as 9/11. I know I do. We were all glued to the television, it seemed, riveted by the repeated broadcasts of incomprehensible events. It was difficult enough viewing the unfolding tragedy from the comfort of our homes, but this book is an eyewitness account. Artie Van Why lived it. The author was in love with New York City and The World Trade Center area. He worked for a law firm just across from it. He loved the ritual of getting his daily coffee from the “coffee man” in the area, browsing in the bookstore in Building Number 5, sitting in the plaza area of the World Trade precinct, people-watching, the free noontime concerts during the summer, the spontaneous dancing that occurred as people, young and old, New Yorkers and tourists alike would respond to the music. These were the all the small and large things that made up life in the city. Referring to this special place he writes “it was an oasis for the worker in a tedious workday, a fascination for the visitor seeing the sights, a small world of its own that held some of the elements that make New York so dynamic, so interesting, and oh so alive. It had a breath of its own.” And then the unthinkable happened and destroyed that reverie. 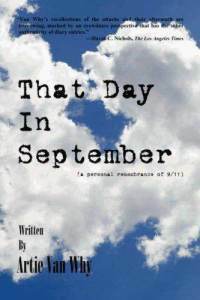 The events of “that day in September” are clearly and soberly described. The reader gets a sense of the reality of the events – it’s not just a story - the confusion, the panic, and the sheer horror of seeing people jumping from the towers to their death. Fortunately each chapter of the book is short, usually consisting of one or two pages only. On the whole, I believe the message is positive. The author has chosen to move ahead, one day at a time. Writing this account of his experiences on “that day in September” has enabled him to do so. I’m glad I’ve had the opportunity to read his memoir. It was horrible to live through it at home via the TV - I can't imagine living through it in person. I agree with your thoughts on Van Why's account (which I reviewed too)! His is a powerful account of a horrific day! I read & reviewed Artie's book too. I can't imagine what people went through down there that day, but Srtie certainly gives us a powerful memoir of that day and beyond.